Malala Day is being celebrated in honour of the birthday of Malala Yousafzai, the Pakistani girl who was shot for attending school in defiance of the Taliban. Malala celebrated her 17th birthday in Nigeria and joined her voice to help renew calls to bring back the schoolgirls kidnapped by Boko Haram in April. Malala and millions of girls like her around the world continue to show us that they are stronger than violence, stronger than oppression, stronger than fear… Today, Malala challenges us to show the world what we are stronger than with the #STRONGERTHAN message. And most of all her fears. Have I stood up for what is right? Have I spoken for the voiceless? Have I used my resources for the needy? The lethargy that paralyses me? What are you stronger than? Donate towards the Malala Fund towards empowering girls through education to achieve their potential and be agents of positive change in their communities. 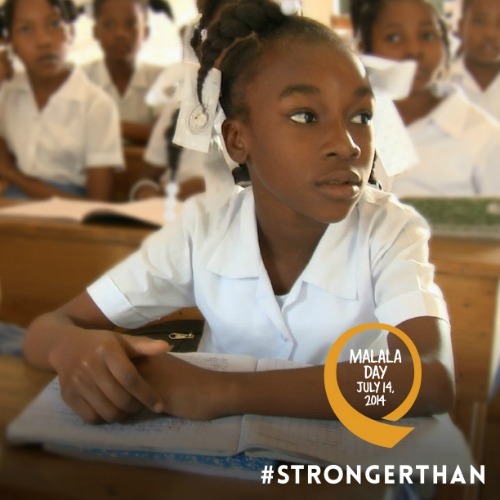 Share your own message using the hashtag #STRONGERTHAN message on Social Media and connect with the Malala Fund on Facebook and Twitter. We need more courageous girls like Malala to fight the evil world. The fight has already started and let’s all of us do our bit, a baby step, for change. Thanks Corinne for doing your part and sharing with us. Her story is not only awe-inspiring but also has given strength to billions of young girls all over the world. A true HERO. My hero. I am in awe. I am filled with hope. I am brought to my knees. Malala is an amazing young girl! A true champion! Reading, I am Malala, and my respect for her keeps on growing. Salute the little angel for her heroic act and for her continued fight for the girls of the world. The life of this brave soul should inspire youngsters to follow her. It is a wonderful initiative I read about it more, some of the resolutions are quite something.. I salute her courage, and that of so many other young girls and women in Nigeria, Pakistan, Bangladesh who are victims of brutal oppression, terrorism, unimaginable cruelty, and barbarism. Malala is amazing. Her courage challenges me to be bold about speaking up. Thank you sharing this today. Malala is a courageous girl. May her voice gets more support and power! I definitely salute the brave heart! Malala is an amazing young woman with an incredible story.